LAKE OSWEGO, Ore. - Nov. 4, 2016 - PRLog -- Gavin Frye will be Petra's guest on Revealing Conversations with Petra Nicoll, a Blogtalk radio show, on November 8, 2016. 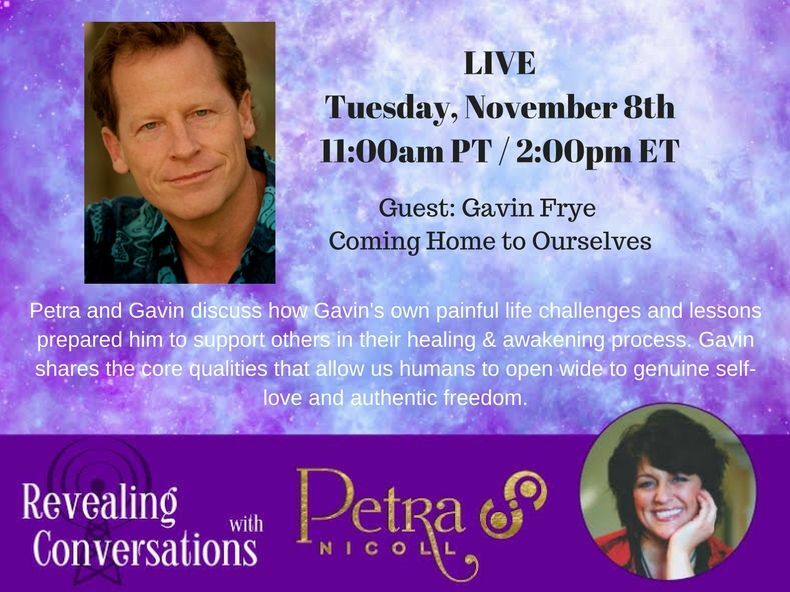 Gavin Frye shares how his own painful life challenges and lessons prepared him to support others in their healing & awakening process. "We build a relationship with our own vulnerability so it becomes a loyal friend and powerful gateway for profound healing and authentic creative expression," says Frye. Gavin Frye has been a licensed psychotherapist and mentor for 35 years and works via the Internet with people from all around the world. He specializes in powerfully assisting clients in navigating their healing and awakening process with a soul-centered approach to counseling. He's also designed and facilitates an 11-month transformational workshop series entitled, Soul-Centered Living. Gavin's work has often been characterized as a process of assisting others in coming home to themselves. He brings a wealth of training and rich life experience to his work along with his signature vulnerability, joy, compassion and dedication to be living at the frontier edges of his own personal journey. Revealing Conversations with Petra Nicoll airs every Tuesday at 11:00am PST. Listeners are invited to listen live or to an archived recording. Host, Transformational Story Coach, Petra Nicoll's trials and tribulations in her own life have inspired her book, Petra's Ashes: A Transcendental Journey (2016 release) and have made her who she is today – a compassionate, insightful and loving being who can understand and help you rise like a phoenix and soar and help you get closer to your true potential. Listeners are invited to receive a gift of Petra's Meditation MP3.